The ruler of Qatar Sheikh Tamim bin Hamad al Thani Tuesday renewed his country’s readiness to engage in dialogue with its neighbors. “We’ve always said that we’re very open for dialogue, and we’ll always be open for dialogue,” Sheikh Tamim said in a statement to the media before a meeting with US President Donald Trump, in New York, on the sidelines of the UN General Assembly. Qatar has been embroiled in a crisis with its neighbors, namely Saudi Arabia, the United Arab Emirates and Bahrain, plus Egypt since June 5, after the four countries severed diplomatic ties and cut air, sea and ground links with Doha that they accuse of supporting terrorism. Doha has vehemently denied the charges and has pointed out that it is victim of a smear campaign. The boycotting countries have issued a list of 13 demands including shut-down of Doha-based Al Jazeera network and reduction of the diplomatic ties with Iran before thawing ties. 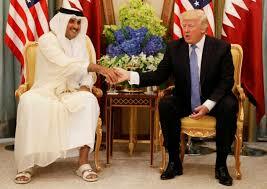 The Qatari ruler said he is convinced that an interference on the part of President Trump will help solve Qatar’s problems with its neighbors. “We have a problem with our neighbors, and your interference will help a lot. And I’m sure that, with your interference, hopefully we can find a solution for this problem,” he said. Answering him, President Trump said confidently “We will get it solved”. Amidst reports that Saudi Arabia and the UAE have considered taking military action against Qatar, Bloomberg reported that the US warned the two Gulf countries against taking such action. Leaked e-mails dated May 2017 between UAE Ambassador in Washington, Yousef Al-Otaiba, and US diplomat Elliott Abrams revealed that Saudi Arabia was preparing for a military attack on Qatar and that the UAE seemed approving the move. Through the e-mails, the UAE diplomat seemed quite sure that Trump would back the military action. But according to the Middle East Monitor, the US president has reportedly called both countries to back off, arguing that any military action would trigger a crisis across the Middle East. Written by: Jaber Ali on September 20, 2017. Posted by Jaber Ali on Sep 20 2017. Filed under Gulf News, Headlines, World News. You can follow any responses to this entry through the RSS 2.0. Both comments and pings are currently closed.